Zeetings. A platform that we have been using for our presentations in the last few months too. And a platform that we also believe is here to stay! Why? In the video above we brought not just someone who knows something about Zeetings, but the CEO of the company – Robert Kawalski – to talk about why they created this incredible service and why you, as a presenter, should be using it. 356labs will speak at Microsoft Ignite 2016. We are going to deliver two sessions at the biggest and most important yearly conference in the world! In this article we mention three things which should motivate you to always try to get better in presenting and strive to improve as much as you can! Using a ton of foreign words or more concretely using a ton of English words in a non-English-speaking country could be a big big problem. PowerPoint changed a lot in the last few years. Especially if you have an Office 365 Business account, there are just a ton of major(!) improvements in the product - Morph, Zoom, support for SVG files, Icons and that's just to name a few. Most of the built-in PowerPoint templates are not what you should be striving for and using. Why? Find out in this article! Cathrine Wilhelmsen is a true rock start presenter who disrupts how tech presentations are being done. She is also our guest today! Read more here. 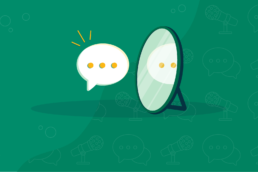 How to Reduce Your Stage Fright by Talking to Yourself. Properly. Do you feel nervous before going on stage? What do you do in moments like this? Do you somehow try to calm yourself down and if so, how? Maybe you have heard of the technique of self-talk and the power it has but how do you effectively talk to yourself then?